This production of Maltby and Shire's ever-popular off-Broadway revue of songs about relationships, was first intended to be an end-of-term treat for a short run at the Warwick University Chaplaincy. Infact, the opportunity arose for it to the first half of a double bill at London's Millfield Theatre in July 1999. The song cycle ranges from beautiful ballads about relationships and heartbreak ('Fathers of Father', 'It Isn't That Easy', 'Life Story') to jazzy character studies ('Miss Byrd', 'What am I Doing Up on the Roof?') and comic songs about friendship and music ('Three Friends', 'The Sound of Musak'). Performed by a talented company of young singer/actors, two of whom (Jess Plumridge and Nicky Faint)went on to follow very successful careers in entertainment, the production was a well staged chamber piece perfectly suited to the intimacy of the Chaplaincy. It proved to work less well in the huge spaces of London's Millfield Theatre, where it was further hampered by the theatre's long out of date radio microphones. 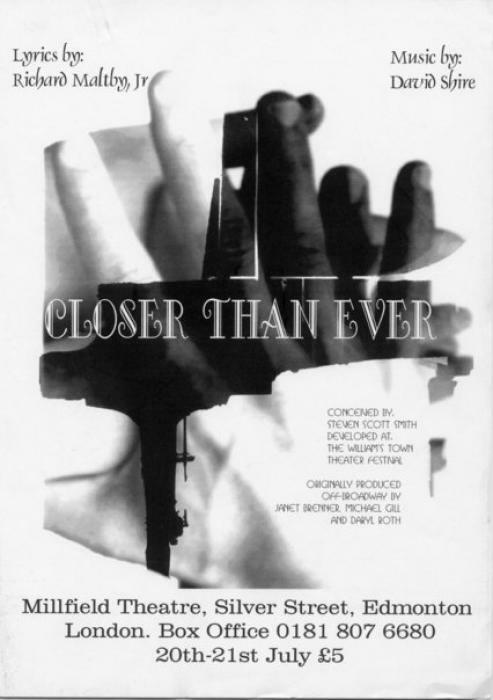 Even so, Closer is remembered fondly as a pleasing and unassuming hour of music, brilliantly written by two of America's most revered and enduring partnerships.